After failing my 3-hour glucose tolerance test today, I received a diagnosis of gestational diabetes. It surely wasn't the news we had prayed and hoped for, and the six-times-daily blood glucose checks, diet modifications, and extra doctor appointments aren't how I would choose to spend the last 11 weeks of pregnancy. But the Lord is keeping my heart peaceful, and just knowing that He knows is so reassuring. What hope I have in those two powerful words: God knows. I'm sure you could recount your own stories as well, but I know for me, it's in the trials that He feels the closest. The pages of my journal during a summer in the Amazon are filled to the brim with reminders of His love for me because I desperately needed that truth. My first time away from Shawn, when I traveled to Vietnam, His presence was so real to me in the darkness of that nation that I often felt I could hear Him audibly. Through break ups, health scares, seasons of loneliness, difficult relationships, the death of loved ones... He shines. In recalling His faithfulness and grace to me in the valleys of my past, I am given so much hope for these last few weeks of pregnancy that I will only grow closer to and more reliant on Him. 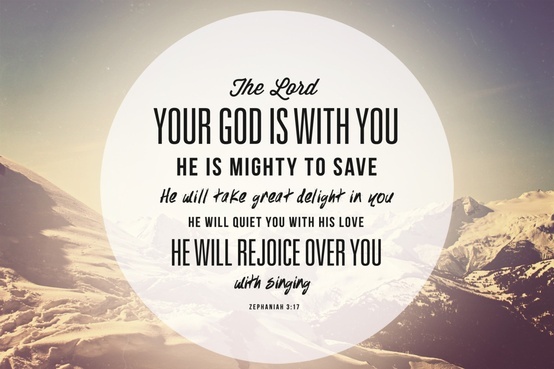 This morning before I headed to the midwife's office, I read Zephaniah 3:17. Just one line of that verse is enough to floor me - but all of it? He delights in me? Rejoices over me? It feels like too much for a girl so undeserving. So really, today was about so much more than a failed blood test and a less than wonderful diagnosis. It was and continues to be about His wooing love for me. In my weakness, He draws me to His strength; in my lack of trust, He reminds me of His perfect faithfulness toward me. I speak PEACE into the atmosphere! Only God can bring a GOOD thing out of a bad report...who's report shall you believe (Isaiah 53:1). It's only a TEST! After ever test comes the BLESSING!!! The devil is a liar and NO WEAPON that is formed shall prosper. Whom God has blessed no man, no situation...NO NO NO can curse. Be still and know that I am God. I pray that the Lord builds a wall around you and anything that tries to come through that wall be burned with the fire of the holy ghost. May every organ, tissue, cell, blood work, bone, vessel, etc. line up with the word of God. He promised to bless me coming in and going out. He promised to bless my womb, children, etc. I stand in agree with all 66 books of the bible that IT IS WRITTEN that I shall LIVE and not die and declare the works of you Lord. I count it done and anything that comes against this prayer be sent to the abyss to be chained and bond until judgement day! In Jesus name, AMEN!!! ***My PEACE I leave with you!!!! Lifting you and Baby E up! Everything will be great. God is so good. Thanks for the reminder to focus on God and cling to Him in times of trial. My sweet little one-year-old had to have blood tests today because she isn't growing properly. It's HARD. I'm glad I don't have to deal with it alone. May you have special grace during the weeks ahead as you have this extra burden on your plate. Because you're gluten free the glucose test is horribly inaccurate. If your worried about it then you should ask to test your levels with a meter and finger sticks after your regular meals. I know that diagnosis can be very discouraging, but maybe try again using a more natural method. So sorry for the diagnosis, but am encouraged by your sense of peace in the situation. Just think of how well you understand your diagnosis (being a nurse already) and are already so perfectly equipped to take care of yourself and baby. Thankfully, it's only temporary! Take care!! God bless you! Thanks for letting His love shine through you! This jewel is one of my all-time favorite verses, Whit. Did you know that there is one verse in all of scripture that says that God sings? This is the verse. And the coolest thing is WHY he sings: over you. I'm sorry about the test, friend! But just reading the words "11 weeks" brought a smile to my face. You're getting so close! Once you have that handsome little boy in your arms, all of the tests, tears, and struggles will be so worth it. It makes me cry to think of the joy you will feel! We haven't met but your perspective in the midst of trials is both refreshing and deeply encouraging. Thank you for being so open and sharing! Praying for you as you continue forth in His steadfast love, and for your sweet little one on the way! He has you both in the palm of His hand, from which you can never be removed. Praying that you are encouraged a little extra today! also all of them are legal so no stress of Authorities site officiel permitted to include more material to the system utilizing Addons.